Monday night is prix fixe night at LOKal and I went to have a catch-up with an old friend. 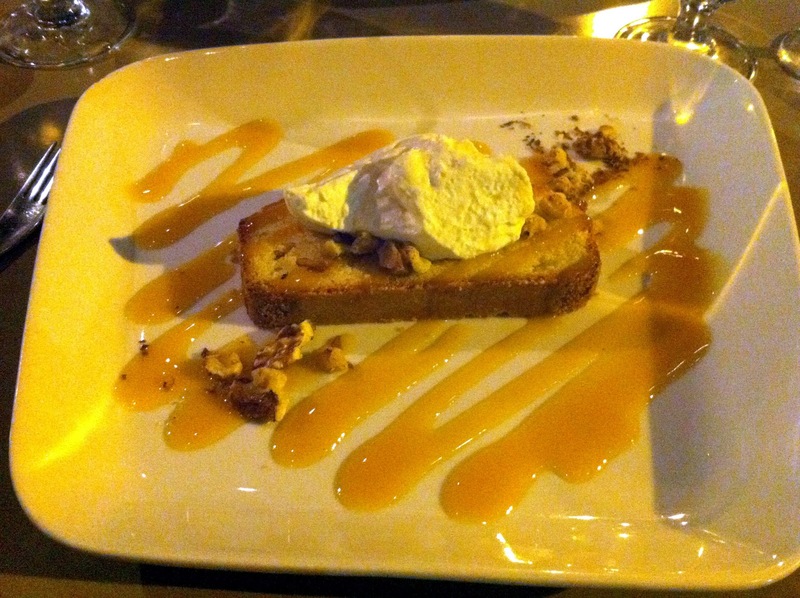 For $40, LOKal offers a five-course meal with wine pairings. It's a great deal with good food, and since I had no idea what was on the menu (they don't even have it in the restaurant, only online), I enjoyed being surprised with each dish. The meal showcased Chef Flowers' talent without taking many risks. Some courses were very impressive, while others appeared interesting but lacked meaningful flavor. The "pan-European" emphasis is present throughout which is something I haven't experience in a while but enjoyed the change of pace. Our service was very good, but some of that could be a result of being the only diners late on a Monday evening. I hope the atmosphere is more exciting on a weekend night. I wish the menu was posted on the website because I did not meticulously write down each course and pairing. I'll do my best to remember with help from the pictures. 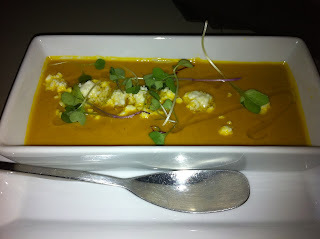 Our first course was soup, squash I believe with chunks of feta cheese. I enjoyed the flavors, nothing overpowering but a nice way to start the meal. Our second course featured a large scallop, cooked very well and lightly seared. It was accompanied by mushrooms and tomatoes. The dark sauce added a very nice flavor, especially for someone not in love with mushrooms. The presentation was first rate. 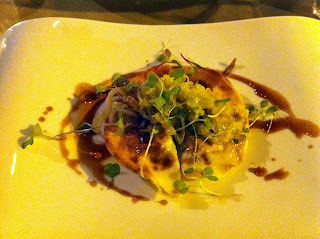 The third course was my favorite - duck pierogi (or something like that). The red wine pairing was spot on and enhanced the already interesting and delicious flavors. I also enjoyed the texture of the dumpling and minced duck. I wanted to eat more of this dish. 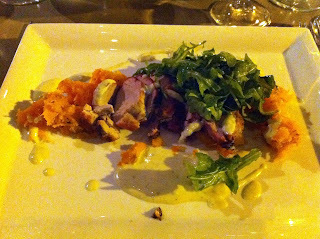 Our fourth course was likely the spotlight course, featuring pork tenderloin, mashed sweet potato, arugula and a blue cheese crumble. I'm not much of a blue cheese fan but it worked with the pork. The sweet potatoes were tasty and a nice complement to the pork. The entire dish was complete and well thought through, but the taste in my mouth was not my favorite. Claire is a fan of blue cheese and really enjoyed the dish, and since I had no major complaints, maybe it's just my taste buds. The wine pairing was also a let down and did not do justice to the blue cheese pork medallions. 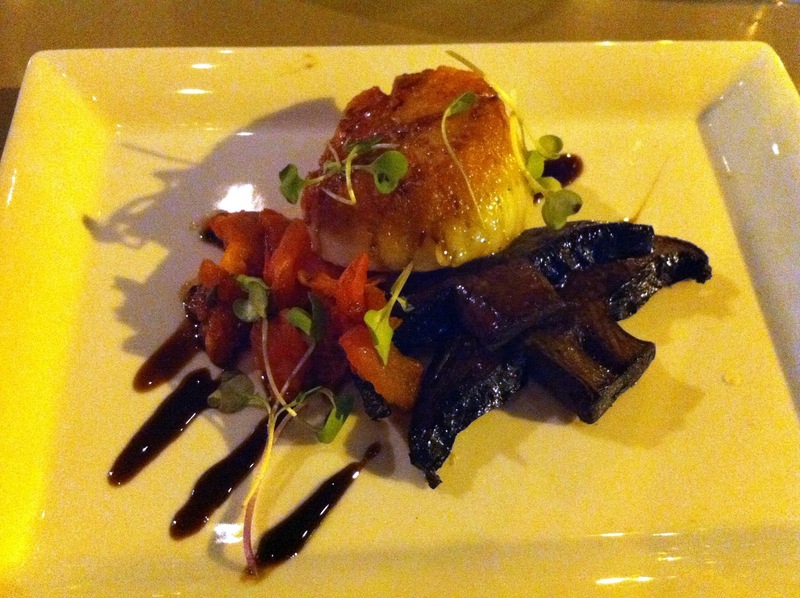 The best part was the autumn feel and inspiration of the dish, a reminder of all the benefits of a changing season. The final and dessert course of the evening was a disappointment. It was a pound cake of sorts topped with whipped cream and served with nuts and fruit sauce. The cake was not very tasty and had a stale quality. Since I did not love the pork I was hoping for a standout pastry. Oh well. It did not ruin the evening, I just wanted to end on a more solid note, especially with the wine all gone. Even though the value is very good, I don't know if I would run back. I recommend checking out LOKal if you want a change of pace. The food is well prepared and artistically presented, but the flavors lack excitement and consistency to qualify for the next level.